Viewing time: 4 mins. 41 secs. The Write Question is a weekly video podcast all about writing. Today’s question is about how to know when your your book mindmap is ready. If you have a question you’d like me to answer you can email me at daphne@publicationcoach.com, tweet me @pubcoach, or leave a message for me at the Skype account, The Write Question. 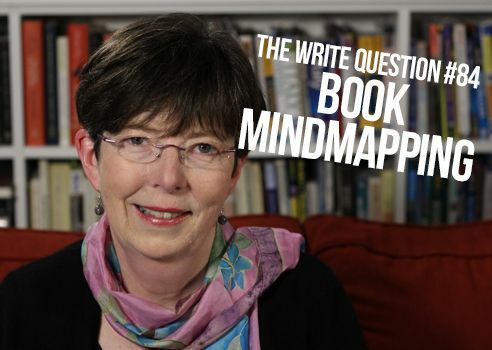 Welcome to The Write Question, I’m Daphne Gray-Grant and my topic today is about how to know when your book mindmap is ready. I have a question from Caty Ribas, a post doc student based in Madrid, Spain. Here’s what’s she’s asked. Thanks for your interesting questions, Caty. Because some viewers might not be familiar with mindmapping, I’m providing two links below. One describes how to do the regular inspirational mindmap. And the other addresses the topic of organizational mindmaps for books. The approach I recommend for mindmapping is similar to the one I suggest for writing. Don’t worry about being perfect while you’re doing it. Getting perfection — or as close to it as we can — is the job of editing, not creating. And yes, this editing will be hard, time-consuming work. I estimate that editing books takes at least TWICE as long as writing them. But having a better or prettier or more perfect mindmap is not likely to reduce your editing time or make is substantially easier. Why? Because as you become more familiar with your topic and more deeply immersed in your manuscript, you’ll continue to have new ideas and you’ll have to figure out ways to incorporate them. Sometimes, this will be hard! As I was researching my answer for you, I came across a wonderful three-minute video on perfectionism, prepared by the London School of Life. I suggest you watch it and I provide a link below. High standards only become a problem when we think something might and should be substantially easier than it turns out to be. And when we read our struggles as marks of our own ineptitude rather than as an inevitable part of a legitimately lengthy journey. Perfectionism is only a problem because we have under-budgeted for difficulty – not because we are aiming high. I think it’s worth acknowledging to yourself that writing a book is a challenging, time-consuming job. It’s work that requires a great deal of time, energy and commitment. I just shipped my next book off to my copy editor and I can tell you it was way more onerous than I expected. And I’m a professional writer who’s written a book before. There is nothing easy about the process. Let me also share a story about my own book that you might find instructive. I had to move one of my chapters to an entirely different spot from the one I’d planned originally. Long after I’d done my mindmap, I had a sudden vision for the overall organization of the book. It was different from the first vision I’d had. And it was better. Could I have come up with this new idea with more careful mindmapping? I doubt it. I think it was a product of the amount of time I’d spent thinking about the manuscript and the many hours of writing and editing I’d logged. Mindmapping is a great tool. But it’s not a Swiss Army knife; it can’t do everything. The ultimate secret to really good writing and to an excellent book is rigorous editing. Thanks for the question, Caty! I encourage you to keep on mindmapping. But don’t expect your mindmaps to be perfect. Instead, expect them to have flaws and oversights and imperfections. Just like us!